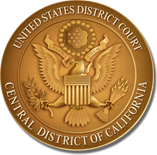 Welcome to the section of this website designed to assist members of the media covering cases or developments in the United States District Court for the Central District of California. The Court is committed to facilitating access to case information, documents, and proceedings, and to keeping the public informed about new developments at the Court. For an overview of topics relevant to covering cases in our district, please refer to the General Informational Guide for the Media. Other information relevant to media personnel can be found by following the links on the left. Please do not contact the Clerk's Office to inquire about a verdict or to find out when or where a hearing (or other proceeding) will take place. A verdict will appear on a case's electronic docket (on CM/ECF or PACER), and all proceedings will appear on the master calendar, as directed by the presiding judge. Members of the media should not contact the presiding judge's chambers or courtroom deputy. Other inquiries about publicly available information that cannot be answered via the links on this page may be directed to the Chief Deputy of Operations at (213) 894-8481. Docket information cannot be obtained over the phone from the Clerk's Office. The Case Management Electronic Filing System (CMECF) provides access to dockets (case information) via the Internet for a fee of $.10 per page. To establish a PACER account, contact the PACER Service Center.